Californians love adventure. From extreme sports like skateboarding to adventure sports like zip lining and kayaking, countless people live in and visit California because they enjoy a thrill. While an element of risk is almost a requirement for these activities, adventurers should also be able to trust that the companies that market these thrills are taking steps to ensure participants are kept safe. People who’ve suffered an extreme sports or adventure sports injury (and families left with a void after a death) should not assume they are without recourse. Our San Francisco recreational injury lawyer can help. Recently, a vacation adventure turned into a nightmare for a Bay Area woman who was vacationing in Mexico. According to the San Francisco Chronicle, the Cloverdale mom said she was riding a zip line across a forested gorge in Puerto Vallarta when she suddenly began to fall and landed upside down in a tree. The woman’s husband, fellow travelers, and employees of the zip line company reportedly worked for about thirty minutes before they were able to free her from the branches. She suffered cable burns, substantial bruising, open wounds, and a possible torn ACL in the incident. According to the article, a manager from the zip line company told another local reporter that the zip line did not break or detach but instead “only drooped” due to the failure of a cable support mechanism. While the employee said she believed the drop occurred slowly, the victim said it felt like a free-fall and other travelers said they heard they heard the line snap and saw the resulting fall. 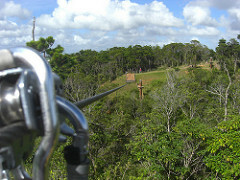 The Chronicle cites a travel website that says the zip line is 500-feet high and travels almost four-tenths of a mile. Extreme sports and adventure activities are becoming more and more popular. Along with this rise in popularity, there has also been a rise in injuries tied to these activities. A report by Nationwide Children’s Hospital in October 2015 found zip lining led to some 16,850 emergency visits for nonfatal injuries in the U.S. between 1997 and 2012. A whopping 70% of those injuries occurred in the last four years of the fifteen-year period. Researchers identified more than 3,600 ER visits in the U.S. for non-fatal zip line injuries in 2012 alone. Falls accounted for 77% of the studied injuries and collisions (e.g., colliding with a tree or other structure) accounted for 13% of the injuries. Broken bones occurred in 46% of the incidents, bruises in 15.2%, strains/sprains in 15.1%, and closed head injuries including concussions were involved in 7% of the emergency room visits. Eleven percent of the visits led to a hospitalization. Alongside the rise in zip lining injuries, other extreme sports and adventure activities have seen a rise in injuries in recent years. In 2014, HealthDay reported that extreme sports (e.g., skateboarding and mountain biking) have been linked to over 4 million injuries in 2000 and are now responsible for more than 40,000 head and neck injuries alone each year. Those figures do not include injuries from other forms of adventure activities. We suspect the numbers would rise substantially if things like zip lining and bungee jumping were included alongside the sports activities. When people engage in thrill-seeking activities, they do assume some risk of injury. However, that does not mean that all adventure injuries are the fault of the participant. In some cases, a company commits negligence by not maintaining equipment properly, failing to train employees on safety matters, or otherwise unreasonably increasing the risk of an injury or even death. Other times, companies downplay the risk of injury in marketing materials and create a false sense of security in participants. When this sort of negligence or inappropriate marketing lead to injuries, the injured party may have a right to compensation and should contact an attorney promptly. Many companies require people to sign a liability waiver before participating in adventuresome activities. In some cases, waivers are indeed valid. However, in other cases the law allows an injured party to overcome even an express written waiver. For example, California does not allow companies to waive claims of gross negligence (i.e. the most basic standards of care), does not permit waivers that violate public policy, and does not allow the waiver of product liability claims. Simply put, injured parties and their families should not assume a waiver is valid without the advice of counsel. When people are injured during thrill-seeking activities, the companies involved inevitably try to distance themselves from the injury and convince the injured party that the company is not liable for the incident. Do not simply take their word for this. As a Northern California recreational injury lawyer, Greg Brod offers a free consultation and can help individuals injured in extreme sports in San Francisco and the surrounding regions understand their legal rights. While adventure sports involve some degree of inherent risk, that does not provide an excuse when company negligence leads to injury or other tragedy.